The codeREADr platform isn’t just for scanning barcodes – it can also generate them. Click on the ‘Databases’ link on the navigation menu. Click on the database (or its Edit button) from which you would like to generate barcodes. Click on the barcode link on the top right side of any barcode value entry to generate a barcode image. Note: This is a barcode preview that is only designed to show 1 barcode image at a time. It is possible however to copy this barcode by right clicking the image and saving the image on your computer. 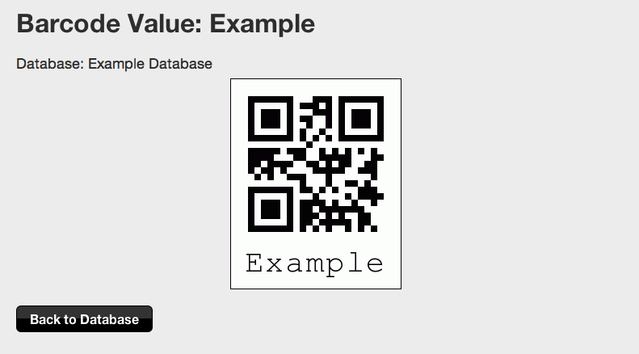 QR code images can be exported in bulk from the Databases page or the Tasks page. Click ‘Export Barcodes’ and we will send you an email with a link to download a ZIP file. From there you can extract your QR codes and merge them into emails using your email service provider. Click the ‘Databases’ link on the Navigation Bar to see a list of your Databases. On the right side next to your databases, you’ll see ‘Export Barcodes’. Alternatively, developers can use our APIs to get your QR codes via XML. Without a paid plan you can generate both Standard and Branded QR codes for testing purposes. A Standard QR code includes just the QR code and associated human-readable text. Branded QR codes can be customized with an image and text. If you’ve signed up for at least a 5-Device paid plan, you can generate a large number of QR codes. You can upgrade to a paid plan and downgrade back to the Free Plan as needed. There is a limit of 100MB per generation request. The number of QR codes that limit represents depends on the image used and the QR code size. The typical size for a Standard QR code is 5KB. The typical size of a Branded QR code is 25KB (assumes small image size – e.g. 120×120 pixels). Standard ~ 20,000 QR codes (typical). If the number of values in your database could create an export file larger than the 100MB limit, please contact bizdev@codereadr.com. For more information on branded QR codes please click here. Important: One of the benefits of branded QR codes is customization. Particularly valuable is the ability to control the viewable size of the text embedded in the barcode. For example, if using the name of the person, location, asset, etc. as the QR code value, then you can adjust the text to be smaller. You can also add static text like ‘Contact us at …’ and your logo. You can use mail merge to insert your exported images into documents, emails, etc. To print them on labels we recommend that you purchase label sheets (Avery, etc.) where the entire sheet is a single, adhesive-backed label. Once printed you can then use a paper cutter or scissors to cut out the individual barcodes. If you have a large number of barcodes to print you might consider buying a purpose-build program like iBarcoder for PC and MAC; or buying labels in bulk from a label printer like ImageTek; or plastic cards from Plastic Printers. Note: there are many excellent label printers globally – ideally look for ones that can print variable data QR codes as they are the best for scanning.